Letting players get close to the action from their favorite strategy games often seems like an idea with a lot of potential. That potential can be met with varying results (see: Command %26amp; Conquer Renegade), but Front Mission Evolved %26ndash; being a third-person shooter as opposed to a turn-based strategy game %26ndash; has the added advantage of being about freakin%26rsquo; huge robots, and those are always a hit with gamers, right? While the game is in the same universe as its predecessors, you%26rsquo;re not required to know anything about the Front Mission series in order to understand what%26rsquo;s going on. In fact, the story probably won%26rsquo;t be the main draw unless you%26rsquo;re a die-hard fan of Japanese mech narratives. The plot serves its purpose of getting a bunch of Wanzers, the giant mechs of the series, to duke it out, but it%26rsquo;s probably not something that will stick with you. Throughout most of the game you%26rsquo;ll be piloting your own personal Wanzer, which you can customize from mission to mission. There are plenty of customization options %26ndash; from parts to weapons to colors and emblems %26ndash; to create a Wanzer to fit your playing style. 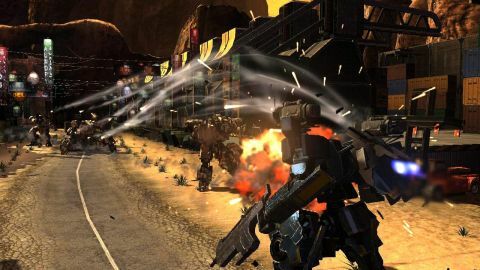 However, if you don%26rsquo;t want to waste time adding parts and worrying about weight versus power output on your mech, you can opt to play with one of the preset Wanzers that the game provides, which is a handy option for action gamers who only want to jump into the action and blow things up. Unfortunately, the only things they%26rsquo;ll be blowing up are tanks, helicopters and opposing Wanzers. For being a game about giant robots, the environment is disappointingly non-destructible. You can step on a few trees and crush a few columns, but that%26rsquo;s practically it. There%26rsquo;s hardly anything that explodes really nicely, and as such you sometimes don%26rsquo;t feel like you%26rsquo;re really piloting a towering death machine. Actually controlling the Wanzer, though, feels pretty good. You always have quick and easy access to each of your weapons, and functions like jumping and dodging work as they should. As such, doing battle at the helm of a Wanzer is typically fast-paced and a lot of fun. Whether you%26rsquo;re sniping another mech from long range, launching a flurry of rockets at a tank or dueling mano-a-mano (mech-a-mech?) with melee attacks, the fighting is generally satisfying. There is also a fair bit of variety in the missions, so you%26rsquo;ll get some nice changes of scenery throughout the campaign. The game occasionally tries to mix things up with some on-foot missions, however, which are significantly less enjoyable. It might be telling that while your gigantic, metal robot can jump, your human character himself cannot. On-foot missions are barebones and mostly a chore, though they%26rsquo;re typically not too frustrating, either. On the upside, there aren%26rsquo;t many of them throughout the campaign. The campaign clocks in at a fairly action game average of around 10 hours, but you can go back and find a bunch of hidden objects %26ndash; mostly sensors and emblems %26ndash; if you%26rsquo;re a completionist or just an Achievement/Trophy whore. Then there%26rsquo;s multiplayer. Most of the customization options from the campaign make their way over to the online experience, which leads to a cool Modern Warfare-esque progression system that will probably provide hours of fun for the people who get way into it. However, this might actually be a bad thing for brand new players, as everybody starts out with a fairly crappy Wanzer with only the most basic weaponry %26ndash; it%26rsquo;s not until after you play for awhile when you gain access to cool weapons and abilities like being able to repair yourself and nearby allies. So when you first start playing online, especially if you start with a free-for-all deathmatch, there%26rsquo;s a chance that you%26rsquo;ll be obliterated by opponents that have much better skills than you do, and there%26rsquo;s not much you can do about it. This could be problematic from a balance perspective, depending on how well matchmaking ultimately works and serves players. Regardless, we%26rsquo;d probably recommend playing some team-based games until you start unlocking better gear. The biggest downside to the multiplayer is a lack of variety. Out of the box, Front Mission Evolved includes a mere four gameplay modes on only five basic maps. These modes are pretty solid and can be pretty enjoyable, but there%26rsquo;s a good chance you%26rsquo;ll get tired of them quickly, especially when playing the same maps over and over. These problems aside, there is a genuinely good time to be had with portions of Front Mission Evolved, provided you bring with you a certain love for mechs. It%26rsquo;s probably not the high point of the series, but fans of the Front Mission universe and/or giant robots might find something to like here. The classic Front Mission franchise comes to next-gen, but it's taken a bit of a turn. Formerly a strategy game, now mechs battle in this third-person shooter in real time. It's a decent enough action effort, although the non-destructible environments dissapoint and the on-foot sections are weak.